Real History | Real Hands-on | Real Investigations | REAL FUN! Haunted Knoxville Ghost Tours is a Hands-On Paranormal Adventure that gives the participant the opportunity to Investigate the Historic and Haunted side of Knoxville TN and Special Event Venues. 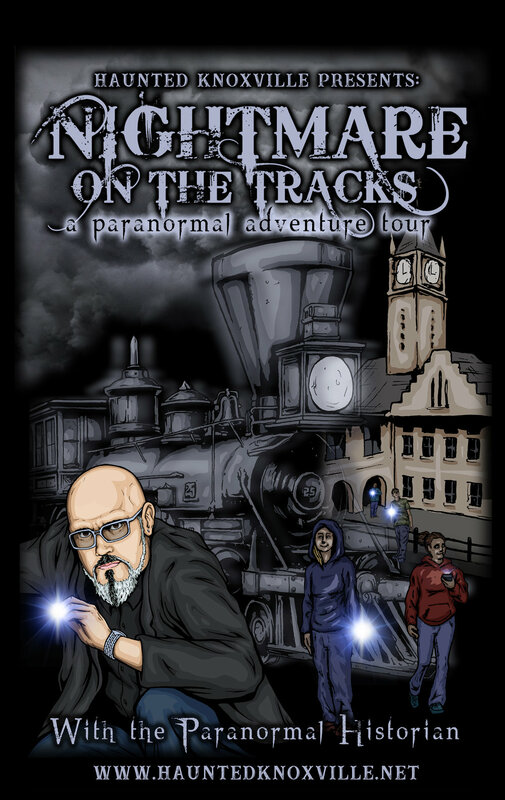 The events include the use of Paranormal Investigation Tools and is Host by Famed Paranormal Historian and Master Teacher in the Paranormal Field, J-Adam Smith This Tour is not just your ordinary Ghost Tour it is TRULY an Adventure. Tickets Range from $25 to $60 depending on the Event and the Location! We were founded in the winter of 2010 and our tours are based on information that our “Founder and Visionary”, J-Adam Smith, discovered while researching the Beautiful City of Knoxville. He found that there were many intriguing stories that have been lost from the public eye. A rich past that should not be forgotten. J-Adam Smith felt that Knoxville needed a unique Ghost Tour. He recognized that there was rich history and a lack of historical Walking Tours in the City of Knoxville and felt the city was long overdue for one of the BEST walking tours in the Country. Some of the Key points of interest on Haunted Knoxville Ghost Tours is the Fact that our Clients are going on an “Investigation” with trained paranormal investigators, to real Factual “Ground Zero’s” (Researched location of traumatic happenings) , and participants are given Tools used by REAL paranormal investigators (as seen on TV). 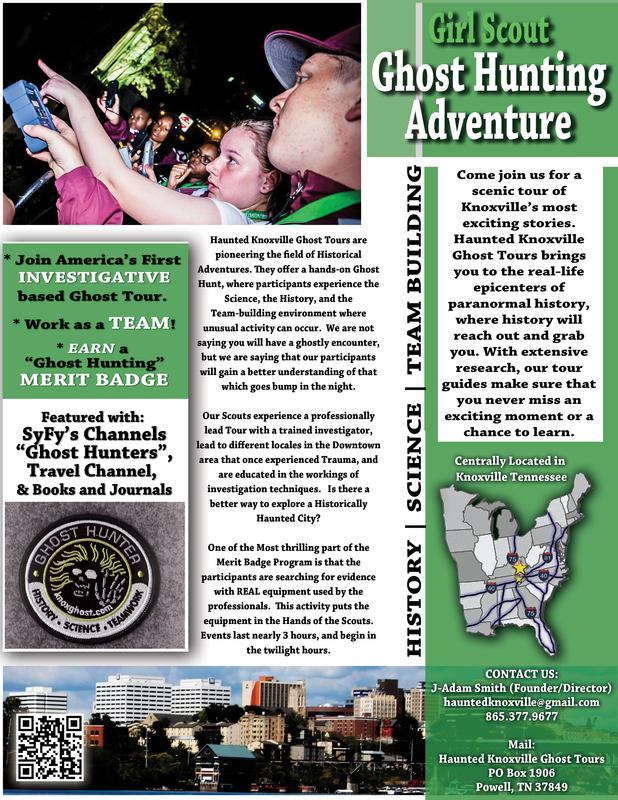 Dig into the science behind ghost hunting with a walking tour by Knoxville Ghost Tours AND earn a patch! Scouts will learn Knoxville history, work as a team, investigate using a variety of equipment, and come to their own conclusions based on the evidence you find! This is a non-scary patch program! Join in on a popular public tour (Friday and Saturday nights) or schedule your own private tour (for up to 30 people). Additional Patches are available for $5 each. This activity is suggested for girls age 9 and up. Adult chaperons are required. 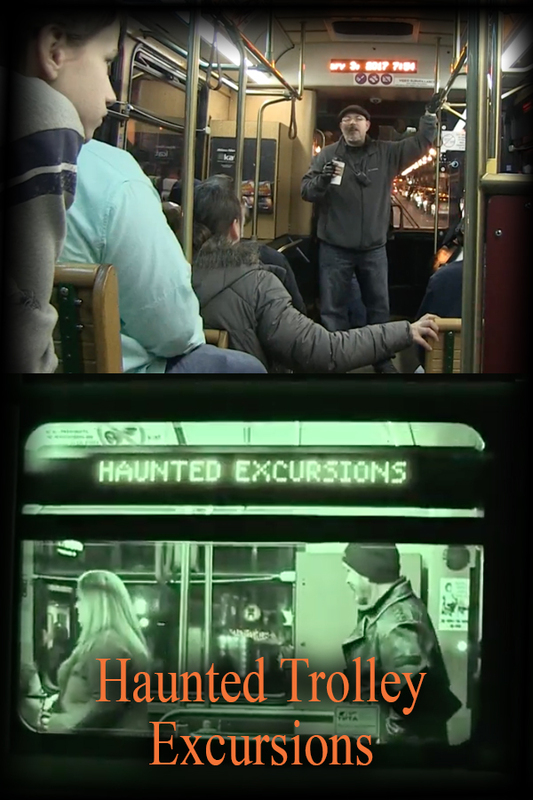 Haunted Trolley Excursions explore haunted sites that have never been investigate public such as Civil War Hospital grounds, location where there was once a gallows, and the location where the dead were transported due to a tragic accident without exposing the locations. This tour is a must for the Adventure seekers. Click here to Decide for yourself whether ghosts and the paranormal exist! Check out these 100% real experiences on Haunted Knoxville Ghost Tours!